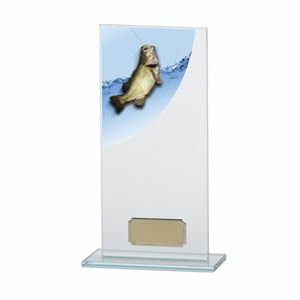 The crystal plaque is made from 5 mm thick clear jade premium glass with rainbow etch finish. 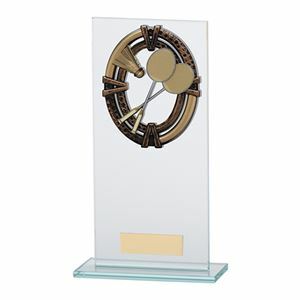 The Maverick Legacy Glass Field Hockey Trophy has a two toned bronze coloured plastic shield with a hockey goal net and sticks. The Maverick Legacy Glass Table Tennis Trophy is made from premium 5mm thick clear jade toned glass and has a rainbow etched finish. 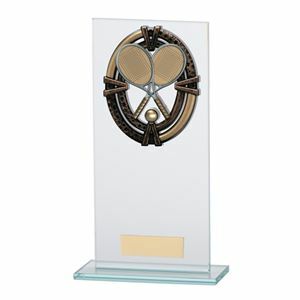 The award features two table tennis bronze coloured bats and ball set onto two oval shaped rings. This shield is made from quality lacquered plastic. This award features a bowling ball striking pins on a bowling alley. These are set on two oval shaped rings. 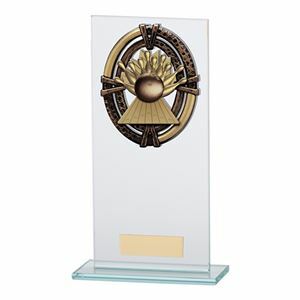 The Maverick Legacy Glass Ten Pin Bowling Trophy is made from a high sheen bronze coloured plastic and premium 5mm thick jade toned clear glass with bevelled edges. The Maverick Legacy Glass Motorsport Trophy features an antique bronze coloured racing driver helmet, pistons and chequered flags. 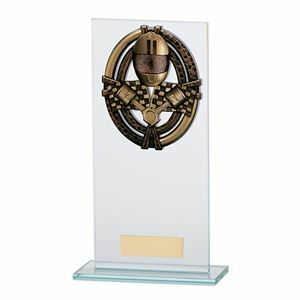 The motor racing award is made from a glossy bronze plastic on a premium 5mm thick jade toned clear glass with bevelled edges. The elegant Maverick Legacy Glass Tennis Trophy features a two toned bronze high grade plastic motif with two tennis rackets and a ball. The crystal plaque is made from premium 5mm thick jade toned clear glass and has been finished with bevelled edges. A two toned bronze quality plastic insignia displays two badminton rackets and a shuttlecock. The elegant crystal plaque of the Maverick Legacy Glass Badminton Trophy is made from premium 5mm thick clear jade toned glass and has been finished with bevelled edges. 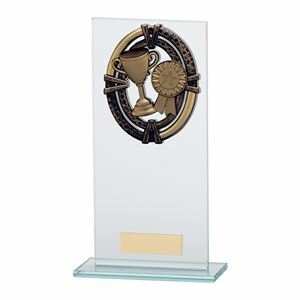 Displaying a two toned bronze quality plastic motif featuring a basketball hoop and ball, the crystal plaque of the Maverick Legacy Glass Basketball Trophy is made from a superior quality 5mm thick jade toned clear glass and is finished with bevelled edges. Two glossy red boxing gloves are featured on the antique bronze premium plastic motif of the Maverick Legacy Glass Boxing Trophy. The crystal plaque is made from premium 5mm thick jade clear glass and finished with bevelled edges. 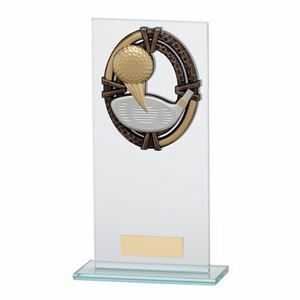 Displaying an antique bronze premium quality plastic motif, the sleek Maverick Legacy Glass Golf Trophy features a silver club striking a golden golf ball. 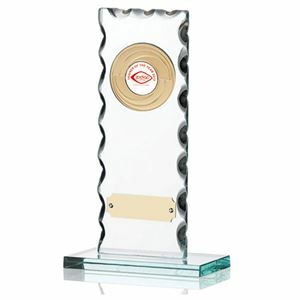 This elegant crystal plaque trophy is made from quality 5mm thick jade toned clear glass and is finished with bevelled edges. The crystal plaque is made from a premium 5mm thick glass with bevelled edges and is jade in tone. 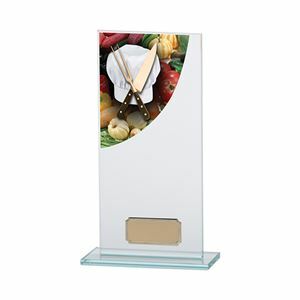 The Colour Curve Cooking Glass Trophy has a curved vivid colour image of a carving knife and fork with chef's hat on a background of fresh vegetables. This quality image is printed on a self adhesive acrylic curve.